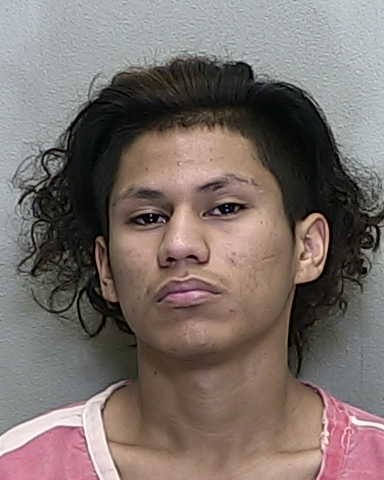 MARION COUNTY, Florida (January 18, 2019) – On Tuesday, January 15, 2019, Marion County Sheriff’s Office (MCSO) Major Crimes detectives arrested and charged 16-year old Luis Ortega (DOB: 09/19/2002) with First Degree Premeditated Murder for the homicide of 18-year old Brandon Hammett (DOB: 04/27/2000). Hammett was shot and killed by Ortega during an attempted robbery on October 26, 2018. On Friday, October 26th, at approximately 6:30 p.m., multiple MCSO deputies and Ocala Police Department officers responded to the area of 3200th block of SW 43rd Court in reference to a shooting. When units arrived on scene, they found Hammett in a vehicle suffering from gunshot wounds. He was transported to the hospital, where he later passed away from his injuries. MCSO Major Crimes detectives conducted a thorough investigation and discovered that Dalton Purvis (DOB: 06/10/1999), felt that he had been cut short on the last batch of marijuana Hammett sold him. Purvis gathered Denver Sutter (DOB: 11/22/1999) and Carlos Flores-Renteria (DOB: 01/29/2002) together and developed a plan with them to rob Hammett. Purvis also asked if Flores-Renteria could invite Ortega to come along, because he knew Ortega had a gun. Purvis, Sutter and Flores-Renteria told detectives that they intended on Ortega’s presence to serve for security and intimidation purposes. The four suspects then met Hammett at the incident location in order to “buy more marijuana.” However, when Hammett arrived, the suspects told Hammett to hand over everything he had to them. According to suspects’ statements, it was at this time when Hammett put his vehicle in reverse in an attempt to flee the scene. Ortega then shot Hammett while he was backing up. Purvis, Sutter and Flores-Renteria were arrested and charged with Felony Murder in the days following the shooting. A grand jury was convened on Tuesday, January 15, 2019, and a grand jury indicted Ortega for the charge of First Degree Premediated Murder and later that same day, Ortega was located and arrested for the grand jury’s warrant. During his interview with detectives on Tuesday, Ortega confessed to shooting and killing Hammett. Ortega is currently being held in the Marion County Jail on no bond.